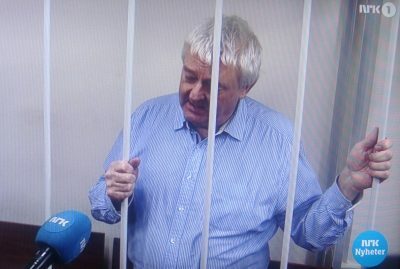 “I feel terribly misused,” exclaimed Frode Berg, the retired Norwegian border inspector who was arrested in Moscow last month and charged with espionage. As he was ordered held in a Moscow jail for another three months on Friday, he once again had to fight back tears, while his lawyer won’t rule out that he’s been “misused” by Norwegian intelligence agents. Norwegian Broadcasting (NRK) reported how Berg, age 62, was led into a Moscow courtroom on Friday by two masked security guards from Russia’s own police intelligence unit FSB. It has accused Berg of being an accessory to spying after arresting him during a weekend trip he made to Moscow in early December. He was found carrying 3,000 euros in cash and, according to Russian media, documents with information about the Russian Navy. Newspaper Aftenposten reported on Friday that Russian court documents that form the basis for Berg’s imprisonment claim he has carried out espionage for and on behalf of the Norwegian intelligence service. “I’m battling anger and hatred,” Berg told Norwegian reporters when he was allowed to speak with Norwegian media assembled in the courtroom. Asked by NRK whether he’d be allowed any visits from his family soon, he said “no,” adding that he declined any opportunity for such a visit. “It would be too difficult for me,” he said, since he’s otherwise being held in solitary confinement. He still claims he can’t understand what he allegedly has done wrong. He claims he’d been asked by two “Norwegian citizens” in Norway to carry the cash to Moscow, and mail it from a Moscow post office. Before he could do that, he was arrested while out walking on a street in Moscow December 5, and has been in custody ever since. Berg has refused to identify the Norwegians who asked him to carry both the money and “several envelopes” to Moscow but Aftenposten reported he has revealed their identities to his Russian defense attorney Ilja Novikov, who has in turn sent the names back to Berg’s Norwegian attorney, Brynjulf Risnes. That means the Russians also have the Norwegians’ names, since all communication between Berg and his Russian attorney is monitored. Berg claims he’s done nothing illegal, and that it’s not illegal to travel with EUR 3,000. “I can’t say anything about who gave me the money,” he told NRK. “It was me who traveled to Moscow, and I’ve been here in many connections.” He added, though, that he now was battling the feelings of “anger and hate” in regards to those who gave him the money and documents that have caused him so much trouble. Novikov won’t rule out the possibility that Berg was tricked or “misused” by people connected to Norway’s own intelligence-gathering agencies. “We still don’t know whether Berg walked into a trap, or whether was, without knowing it, actually involved in a real intelligence operation,” Novikov told newspaper Aftenposten on Friday. Aftenposten reported that FSB’s written complaint about Berg claims the money was going to be sent to a Russian they’ve identified only as “Mr. Z.” Berg said he thought he was supposed to send the money to someone named “Natasha,” but doesn’t remember her last name. The Russians, according to Aftenposten, maintain that the mysterious “Mr Z” has spied on the Russian fleet in the Arctic for Norway. He has allegedly sent classified documents in the mail to addresses used by Norwegian intelligence services. Mr Z allegedly received the addresses from Berg. It’s unclear whether the addresses are in Russia or Norway. “Mr Z” reportedly is not, however, Aleksej Zjitnuk, a 24-year-old Russian who’s also been charged with spying. One theory is that “Mr Z” has neither been charged nor jailed because he cooperated with FSB in luring Berg into a trap. Asked by NRK whether he expected to be held in jail for a long time (if convicted on espionage charges, he faces 10 to 20 years in prison), Berg quickly said “no.” Asked what made him optimistic, Berg answered “I don’t know whether I can say so much about that.” He referred to “conversations with my attorney” and statements made in court before NRK and other media were allowed in. “I did not come here for what I’ve been accused of,” he added. Berg continues to attract strong support from family, friends and even the mayor back home in Kirkenes, the far northern Norwegian city close to the Russian border. “Frode worked for the border commission for 25 years, he’s been involved in our people-to-people cooperation and worked with artistic and cultural projects,” local Rune Rafaelsen told newspaper Dagsavisen last month. Rafaelsen and many others have been shocked and outraged over Berg’s fate during his weekend excursion to Moscow. “Frode Berg is no spy like the Russians claim,” Rafaelsen claimed. “He’s a peacemaker.” Rafaelsen has sent letters on Berg’s behalf to the Norwegian government, urging them to help Berg. He’s seriously concerned about Berg’s live and health and wants Prime Minister Erna Solberg to contact the political leadership in Russia a bring Berg safely home to Kirkenes. The Norwegian government has referred all questions about Berg to the foreign ministry, where officials say the embassy in Moscow is assisting him. They’ve otherwise had little comment, calling his case “a consular matter.” A spokesman for Norway’s foreign intelligence agency known as E-tjenesten, also called it a “consular matter” that’s being handled by the foreign ministry. Novikov has claimed that Norwegian authorities should take responsibility for any involvement they may have had in Berg predicament, and approach Russian authorities on a diplomatic basis to liberate Berg. Aftenposten reported that Norwegian authorities have decided that putting political pressure on their Russian counterparts would more likely hurt Berg’s case than help it.